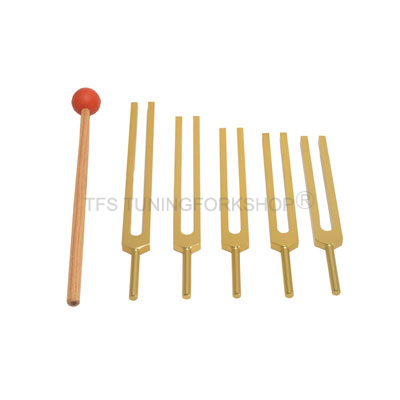 The Sharps Set consists of 5 tuning forks that, like the Harmonic Spectrum Set, are based on the Pythagorean Scale, also known as the Just Scale. The Sharps Set fills in the missing links between the chakras and the basic frequencies of life. They are the "in betweens", the links that are key in the transitions from one frequency to the next, from one chakra to the next, from one element to the next in the process of human involution & evolution. The Sharps Tuning Fork Set has 5 tuning forks. These are based on the Pythagorean or Just Scale.The Harmonic Spectrum Set is also based on this scale. The Sharps Set & the Harmonic Spectrum Set together make a complete octave in the Scale mentioned above. Their frequencies are derived from the Traditional Hindu Chakras.They are in the same middle octave with C being the root chakra, D the sacral charka and so on.This set occupies the absent link between the basic frequencies of life & the charkas. When transition is to be made from one frequency to another. When transition is to be made from one charka to the next. When transition is to be made from one element to the next during human evolution and involution. It is very important in the vibrational makeup of all life. It should be noted that all these frequencies are of the vibrations from intersections of Ida and Pingala while they cross each other at the Sushumna. Only the A# is an exception to this fact. Sacred Chalice - C# 266.6 Hz -The Sacred Chalice is the physical container into which the Divine can enter and be held. In other words, it is a channel for Divine Energy and Consciousness. This frequency of the Sacred Chalice resides between the root and sacral chakras. The color is Orange-Red. Dan Tien - D# 300 Hz - This is frequency of the Dan Tien. Dan Tien is described as an important focal point for internal meditative techniques and refers specifically to the physical center of gravity located in the abdomen (about three finger widths below and two finger widths behind the navel). The dantian or dan tien is important in breathing technique and meditation. it is considered the physical center of gravity of the human body and is the seat of one's internal energy. The color is Gold. Higher Heart - F# 355.5 Hz - This is frequency of the Higher Heart.It is located between throat and heart.It is also called Ananda Khanda. it is an important activator of higher consciousness. When open and balanced we feel compassion and forgiveness for all – including ourselves. The color is Blue-Green. Brain Stem - G# 400 Hz - This is frequency of the Brain Stem. The brain stem (or brainstem) is the lower part of the brain, adjoining and structurally continuous with the spinal cord. this is an extremely important part of the brain as the nerve connections of the motor and sensory systems from the main part of the brain to the rest of the body pass through the brain stem. The brain stem also plays an important role in the regulation of cardiac and respiratory function. It also regulates the central nervous system, and is pivotal in maintaining consciousness and regulating the sleep cycle. The color is Royal Blue. Higher Brain Centers - A# 444.4 Hz - This is frequency of the Higher Brain Centers. Higher brain centres act as "training wheels" for the lower brain by enabling it to adapt to injury. These areas of the brain not only regulate everything in our physical body, but also beyond physical levels. The color is Indigo-Violet.